Hey, good morning. Today, we're going to be talking about our 6012 Mud Dog as a sewer jetting version. Really excited about this product. It comes with a lot of additional features, add-ons for any municipality. You could jet from 2" line all the way up to 12" line. It's a six gallon a minute, 3500 Psi, hot and cold water system, adjustable thermostat, adjustable pressure. It's freeze protected. It's got an inlet filter. You've also got this lockable toolbox on it, and it's really nice. It comes with an additional wash down gun and pressure washing wash down hose. 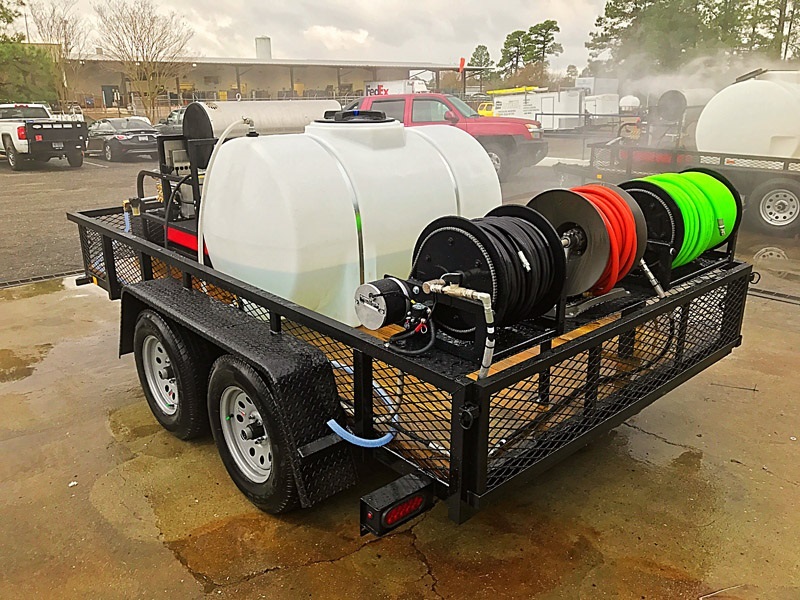 You've got custom nozzles for both your pulverizer, penetrators, flushers, and de-icing nozzles, as well as another 100 foot section of 1/4" hose with a quick connection adaptor kit. You've also got your owner's manual with your chemical injection system if you need it as a wash down. As a standard Mud Dog unit with a pressure gauge so you can control your Psi and GPM on how much you're jetting. We've got this paired with a 250 foot automatic reel, electric, and 400 feet of 1/2" hose, 200 feet of 3/8" hose, and 100 feet of 1" R1 non-conductive 11,000 Psi rated hose. In the center, we've got 100 feet of gerger-genlet low-pressure hose with a float valve system to fill up your 325 gallon tank. I'm going to go ahead and crank the unit up, get it to pressure. Clint's going to be holding it into a 2" pipe so I can show you how you adjust your pressure GPM. Go ahead and crank the unit up. So you can see as ... You're flushing out. Now, hold it right there. This is just a 2" pipe, but that rascal will pull through there like a freight train. You got your thermostat, burner, & pressure gauge. Adjust the pressure ... All right, for-you hold it right there. You can see that we've got wet steam coming out so it's going to break any type of grease, blockages, anything that you've got. This unit's capable of getting rid of roots, debris, sand, mud. Go ahead and open your valve back, flush it. How about pull that line out, and we're going to feed this hose. This is a thermoplastic hose. We could put tiger tails or any kind of band restrictor on it you need. Go ahead and lock it down, and you're ready to roll.